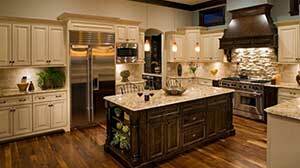 As the hardest working space, kitchen occupies the central area of every house. It is ithe heart of many homes, the place where cooking happens but also where families gather to spend some time, friends socialize over a cup of coffee and sometimes children do their homework. Occupying the second place as the hardest working space, a bathroom is exposed to a great amount of wear and tear every day. Having the right cabinetry in the kitchen, bathroom and even garage is the key to having both an esthetically pleasing and functional space. For nearly two decades, Hollywood Refinishing has been providing our valued clients and companies with a professional, satisfying and outstanding service. We eliminate the task of dividing your project between different architecture and construction companies. We offer design and build services for you, from initial sketches to the final construction. 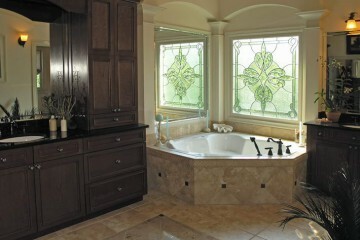 We offer quality tiling and painting solutions for interior and exterior of residential and commercial spaces. Our work not only looks good but also lasts longer. We have a proven record of accomplishment. We ensure that all projects are done with utmost professionalism using quality materials while offering clients support and accessibility. We commit ourselves to complete all projects within the timeline set with our clients. We use the best of technology and tools to ensure that all jobs are done quickly, while giving attention to details and ensuring everything is done correctly. Hollywood Refinishing is your trusted remodeling partner, ready to help you create a unique and impeccable home! I acquired nine pieces of valuable antique furniture, including leather upholstered chairs, a banquet table, a desk and a credenza. Each was intricately crafted and made of beautiful wood but each was also badly damaged by age, wear and abuse. You and your crew did an excellent job of repairing, refinishing, and reupholstering, even replacing wood parts where necessary. Some refinishing and repairing companies work fast, some work cheaply, and others do the job well. Hollywood Refinishing is the only one I have found that combines speed, economy and quality. Now I won’t work with anyone else. I cannot overstate the value of Hollywood Refinishing. We have turned to them for jobs both large and small and they have exceeded our expectations with their timeliness, quality of work and care. Their attention to detail is refreshing and the fact that they are cost effective has been a welcome relief in the current economic climate. We reached out to them for one project and seeing the fantastic job they did with it, we found ourselves contracting them for more and more work. They are always up for a new challenge. was very pleased for the fact that I could get the look that I wanted for my cabinets by refinishing and having extra cabinet space, new counter top, back-splash and re-frame to have my new appliances fit in. Hollywood Refinishing helped me finish my project step by step by choosing samples and buying the right materials, I am very happy with my beautiful kitchen and would recommend you to anyone looking for a reliable company. Thank you! 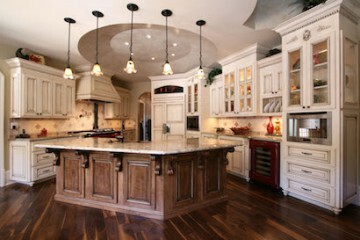 We had a general concept for remodeling our large kitchen and island. 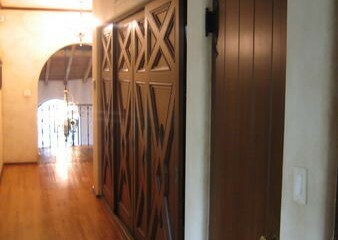 The expert knowledge, craftsmanship and affordability of Hollywood Refinishing made our experience easy. Everyone involved took pride in their work with great attention to detail. 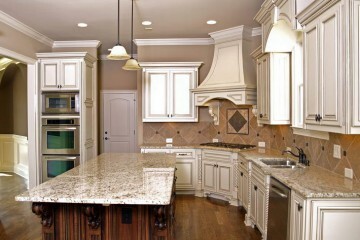 Now we have a dream kitchen and hope to have them renovate our bathroom. In 25 years we've worked with numerous contractors and Hollywood Refinishing stands out as the best! Tarwat, I want you to know how pleased I am with your company. You turned my kitchen into a beautiful, rich and elegant place with the refinishing you did on my cabinets. The work product and service provided by your company has been outstanding. I highly recommend you to anyone looking for superior work and service. Thank you so very much. Thank you, Hollywood Refinishing, for doing an excellent job of refinishing our old kitchen cabinets. We had trouble finding someone that would even attempt the job. 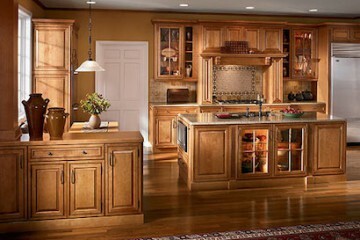 Our cabinets and wood paneling came out like new and you were very reliable in handling the job. We pride ourselves on excellent communication with our clients. No detail is too small for us to put our many talents into and complete our clients' satisfaction.